1. The CXR ratings are much simpler to calculate -- in most cases you can do it in your head. Anyone who has seen the formulas, clauses, and sub-clauses of other popular systems can tell you that they will make your head spin. This makes the other systems virtually non-verifiable -- you cannot know whether they've made a mistake or not. 2. The CXR formulas allow for ratings to be updated after individual games -- multi-round events are not required. This means that tournaments are not the only way to get rated action. Your local CXR chess club can report results of individual games you play there. CXR's ratings and statistics are updated within 24 hours of receiving game results. The CXR system has been thoroughly tested over many years, thousands of players, and tens of thousands of games. The idea behind CXR ratings is that you gain points for good performance and lose points for bad performance. Rated Player: A player who has an established CXR rating. Provisionally-rated Player: A player who has a tentative rating based on an estimated initial rating and the results of less than 5 games against Rated Players. A player whose rating is 1500 defeats an opponent who is rated 1650. A player who is provisionally-rated 1600 draws an opponent who is provisionally-rated 1400. A player rated 1714 loses to an opponent rated 2007. NOTE: When the difference in the ratings of the two players is very large ( e.g. 500 points or more) the formula needs the following three overriding RULES -- otherwise, for example, a 2100-rated player could LOSE 3 points for defeating a 1500-rated opponent! RULE R1: THE WINNING PLAYER ALWAYS MUST GAIN AT LEAST 2 POINTS. RULE R2: THE LOSING PLAYER ALWAYS MUST LOSE AT LEAST 2 POINTS. RULE R3: NEITHER PLAYER MAY GAIN OR LOSE MORE THAN 41 POINTS. In normal tournaments and matches, the rating difference between opponents will rarely exceed 400 points. For situation III, where one player is rated and the other is only provisionally-rated, Formula 2 is used for the rated player, and Formula 3 for the provisionally-rated player. This has the effect of giving the game less weight than normal because the rating of the opponent has less statistical significance, since it is based on few games. This has the effect of heavily weighting both the result of the game and the strength of the rated opponent, thus making a coarse adjustment to the provisional rating. After the fifth such match-up (that is, after 5 games versus rated opponents) the rating is no longer regarded as provisional but, rather, as an established rating. A player whose provisional rating is 1325 defeats an opponent who is rated 1650. For his rated opponent, Formula 2 is employed. RULE R1: The winning Rated player MUST GAIN AT LEAST 2 POINTS. RULE R2: The losing Rated player MUST LOSE AT LEAST 2 POINTS. RULE R4: The Provisionally-Rated player CANNOT GAIN POINTS for a LOSS. RULE R5: The Provisionally-Rated player CANNOT LOSE POINTS for a WIN. = 1506 , a gain of 36 points for losing! But RULE R4 applies, so his or her rating remains 1470. = 2050 , or no gain! But Rule R1 applies, so he or she gains 2, to 2052. The initial rating of a player is the responsibility of the authorized official of the league, team, or club. At present, Chess Express Ratings will accept an established rating from the USCF, FIDE, BALNY, CCLNY, CICL, LIICL, or CCA (in that order). This becomes the initial CXR rating for the player, and is regarded as an established rating. If the player has no established rating but has a provisional rating from the aforementioned organizations, then that will be accepted as the initial CXR rating for the player, but it will be regarded as a provisional rating. If a player has no known rating, the authorized official may assign an estimated initial rating between 800 and 2000. If the player has an internet chess rating from a website such as Yahoo, Chess.net, or the Internet Chess Club, this may be used as a rough guideline. A rating from a reliable chess program such as CHESSMASTER 9000 (or an earlier release) may also give a good estimate. If the official has no idea of the strength of the player, an initial default rating of 1200 should be assigned. In any event, after a few games, the new player's rating will "home in" on the appropriate level. As mentioned earlier, after 5 games have been played against rated opponents, the provisionally-rated player achieves rated status. One objective we consider vital is providing ratings to clubs located in areas where there are few rated players. It is rather difficult for provisionally-rated players to achieve rated status if they cannot find opponents with established ratings. CXR has therefore introduced a second path to reach rated status, even if only provisionally-rated opponents are available. This is by means of Experience Points. Here is how it works. Experience Points (EP) are accumulated as games are played. When 200 EP have been accumulated by a player, his or her provisional rating at that point becomes the initial established rating. The number of EP gained for playing a particular game is 32 EP if the opponent was rated; otherwise 15 percent of the EP of the provisionally-rated opponent (with a minimum of 5 points for a win, or 2 points otherwise). Note that BOTH players gain Experience Points -- neither takes away EP from the other. The CXR System takes care of all the calculations and keeps track of experience points. Once the player has achieved Rated status, CXR begins tracking many additional metrics, and new statistics will soon appear in the player's Folio. Both Experience Points ("Exppts") and Games against Rated Opponents ("GvsR") are shown in the Roster report for club officials. When the CXR rating system was designed, the advantages and shortcomings of other rating systems were examined from many perspectives. Two properties of these systems, it turns out, were linked: The ability to correct errors in the reporting of game results, and rating stability. Errors in reporting game results have always occurred, and will always occur. Some errors have never been detected, some errors have been detected but never corrected, and these two types of cases are therefore embodied in ratings in every rating system. In some systems, errors from the not-so-recent past are corrected, and then ratings are recalculated from the game date onward. This correction and recalculation of ratings then introduces its own problem: The ratings of a player whose game results were entirely correctly reported to the system may change, as he or she played another player whose erroneous game results were corrected. Thus, one correction may result in a "cascade" of rating adjustments. Further, a player whose rating has been, say, 1650 for three months, and has not played in those months, may discover that his or her rating changed last week to 1640, a mysterious development indeed. Such a change may bring into question the stability or credibility of a player's rating in that system. 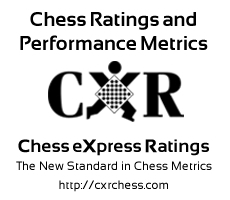 To balance the need for accuracy and stability, the CXR rating system requires chess officials who report games to make corrections to those games within 14 days of the game date. This encourages both officials and players to examine the ratings and wallcharts of events promptly so that the officials may make corrections. From the time a game is initially reported, its results are regarded by CXR as being "unofficial". Once 14 days have elapsed from the game date, the results are "official". Under the CXR rating system, players and officials can trust a rating once the games on which it is based have become official. Thus, the CXR rating system provides a reasonable and standardized timeframe to correct errors while at the same time providing a stable rating to players. Chess Express Ratings, Inc., has a corporate policy of being responsive to the needs and suggestions of the chess community, our customers. We are making available a number of chess performance statistics which were not available before, and will continue to develop more useful measurements of performance.